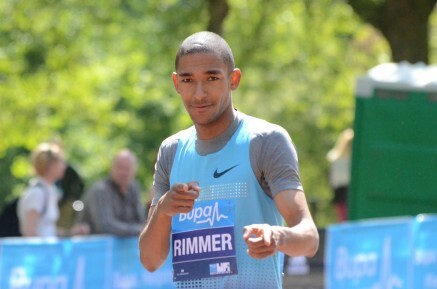 800m wins from Michael Rimmer and Jemma Simpson, 5000m wins from Jo Pavey and Mo Farah, a 400m win from Nicola Sanders and a long jump win from Chris Tomlnson highlighted the PACE group in the Norwich Union British World Championships Trials in windy conditions in Manchester. In the 800m the upcoming stars Rimmer and Simpson dominated thier races with gun to tape victories and left no doubt that they have the ability to improve their personal best performances in the coming weeks. In the men’s 5000m Mo Farah was content to sit and wait until the last mile when he destroyed the oppostion with a 61 second lap en route to a 14 second victory. In the women’s 5000m Jo Pavey choose to destroy the opposition on the first lap immediately opening up a 50m lead before cruising to a 15:17 victory to win by almost a minute from the runner-up. European Indoor Champion Nicola Sanders defended her title with a confident performance in the 400m, her time of 51.33 impressive in the windy weather. ‘Fresh’ from his 2nd place in Monaco on Wednesday night British Record holder Chris Tomlinson left it until the last jump to secure a 10cm victory with 7.99m in the men’s long jump. Elsewhere Mark Lewis-Francis placed 3rd in a competitive men’s 100m and will hope to have done enough to clinch an individual spot for Osaka.